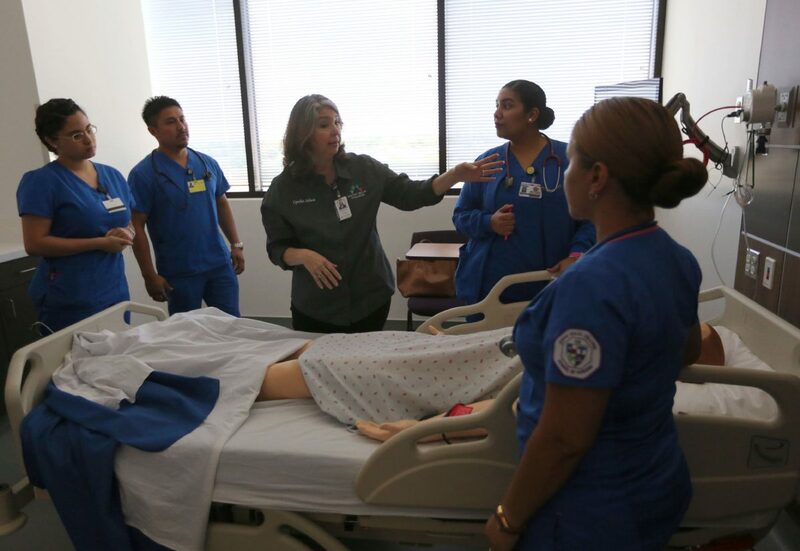 STC nursing instructor Cynthia Salinas, center, explains simulations her students will run through on a patient mannequin Tuesday, May 8, 2018, in the new Allied Health building in McAllen. The mannequins the students use can simulate many body functions and medical problems to help the students learn real-world medical problems. McALLEN — A new state-of-the-art Nursing and Allied Health facility, complete with a simulated hospital wing, was unveiled by South Texas College on Tuesday as students exhibited the facilities’ more sophisticated functions and features. Rangel, 28, was one of the students attending to the hospital’s emergency room, while some of her classmates conducted routine tests, took care of pediatric patients and even delivered babies using these mannequins. This is part of the new technology available in the $24 million, 90,051-square-foot addition located behind the original McAllen nursing building on Vermont Avenue. Among other amenities, the facility also has 11 classrooms, 16 specialty teaching labs, 37 offices, a library with open study areas as well as private study rooms. 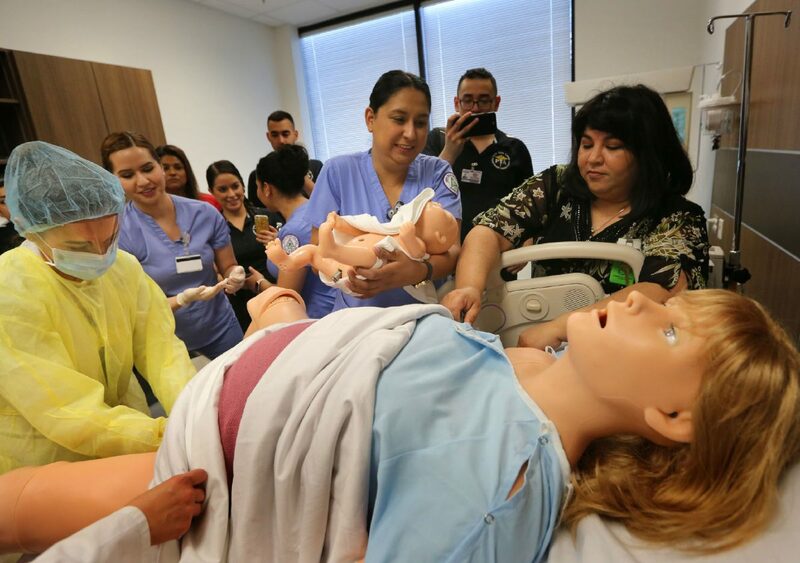 South Texas College nursing student Claudia Caraveo, center, carries a newborn mannequin to its' "mother" during a simulated delivery Tuesday, May 8, 2018, at South Texas College's new Allied Health building in McAllen. The new facility contains a simulation hospital that students from all of STC's health programs can use to gain experience. 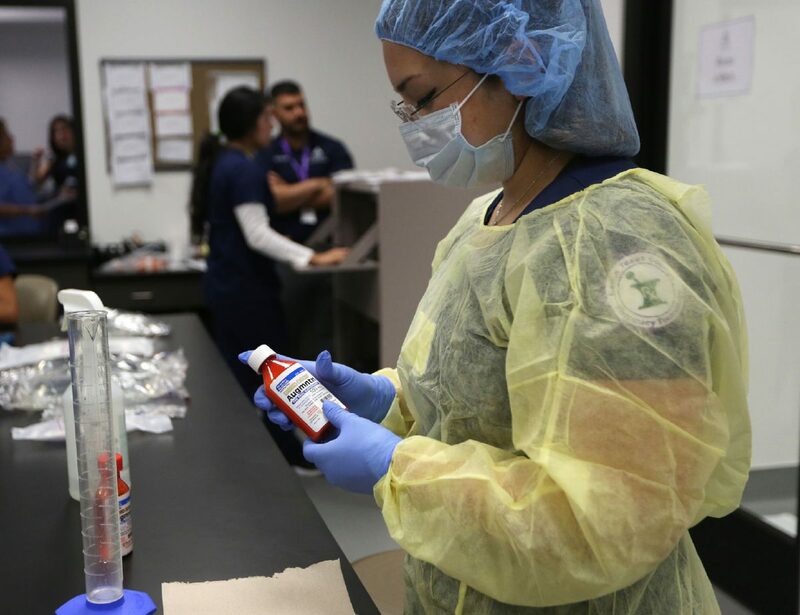 STC pharmacy tech student Rosalba Martinez practices mixing up a medicine Tuesday, May 8, 2018, in the new Allied Health building in McAllen. STC officials broke ground on the project in August 2016, as part of the $159 million bond approved by voters in 2013 for 29 construction projects throughout Hidalgo and Starr counties. The added space will allow the college to produce an estimated 450 additional graduates (yearly) from its associate degree in the nursing and vocational nursing programs. In total, the college currently offers 12 specialty programs, which also include emergency medical technology, pharmacy technology and health and medical administrative services. Back in 2016, as officials celebrated the groundbreaking of the new four-story facility, STC President Shirley Reed said the need to include this addition in the bond projects arose from seeing highly qualified students being rejected from the program due to lack of space. While some areas were still under development, such as part of a computer lab in the library and other small offices, students like Rangel moved in to the new classrooms and training labs this January to begin training on the new technology. The hope is to get them as prepared and comfortable as possible with the regular hospital flow, said Theresa Garza, registered pharmacist leading the pharmacy technology program. Her students now have an assigned pharmacy area in the hospital wing, where they get hands-on practice and one-on-one collaboration with the rest of the programs located there. The idea is to give students a wide array of options in order to fill current and future needs in the Rio Grande Valley’s health industry, as well as to expose them to the latest technology available to better serve their patients — whether made of plastic and wires or actual flesh-and-blood patients.